No spiritual journey can ever be considered complete without a visit to Haridwar, one of the holiest pilgrimage sites for Hindus. Literally meaning 'the abode of Lord Vishnu', Haridwar, located in the Garhwal region of Uttarakhand, is a land of legends and myths. Considered as one of the seven holiest cities in India, Haridwar sees millions of people flock to it every year to pay their respects to the Lord, or to wash away their sins. However, with the passage of time, Haridwar has evolved from being a mere religious city to a multifaceted cultural and spiritual centre, and only after exploring Haridwar will you realize that there is a lot more to the city than just visiting temples and taking a dip in the holy Har ki Pauri. Haridwar has a perennial mystical air around i, and is the perfect holiday option for anyone seeking spiritual connection as well as a chance to indulge in and get closer to nature. Har Ki Pauri is, of course, the most visited place in Haridwar. Har ki Pauri is essentially a ghat built by King Vikramaditya in the memory of his brother, and the location is thronged by devotees all year round. Every evening, as the sun goes down, the Ganga aarti is performed at the ghat, turning the place into a glittering, sensory spectacle. With flaming torches and ringing bells wherever you look, the evening aarti at Har ki Pauri is a mesmerising event that should in no way be missed out on. Other ghats in Haridwar that you can visit are the Gau ghat and the Vishnu Ghat. A place of historical significance in Haridwar is the Bhimgoda Kund/Tank. Situated a short distance away from Har ki Pauri, legend has it that the Pandavas stopped to drink water in Haridwar on their way to the Himalayas, and Bhimgoda was the place where Bhim drew water using just his knee, thus giving birth to its name. It is a famous tourist attraction in Haridwar and draws intrigued visitors all year round. Haridwar has a plethora of temples dedicated to various gods and goddesses. The most famous of these temples include the Mansa Devi temple, the Maya Devi temple, the Chandi Devi temple, the Bharat Mata temple, and the Anandamayi Ashram. A lot of these temples are located on hilltops and offer stunning views of the entire city. A very popular tourist attraction in Haridwar is the Rajaji Tiger Reserve and National Park, which is spread out over an area of 1000 square kilometres and is home to a wide variety of flora and fauna. Another attraction that nature lovers will enjoy is the Neel Dhara Pakshi Vihar, which is a natural park renowned for being an excellent spot for bird-watching. If you’re lucky (and on time), you might even catch a glimpse of the Siberian Crane inside the park! Haridwar is renowned for its street food trail, and some of the must-try dishes include kachoris at Kashyap Kachoriwala and the aloo puri at Mohanji Puriwale. The Chandi Devi Temple of Haridwar is a charming temple perched on the Neel Parvat of the Shivalik Hills. Built in the year 1929 by the then king of Kashmir, it is believed that this temple has existed in one form or the other since the 8th century. This is a very famous pilgrimage and gathers devotees all around the year. Chandi temple is also known as Neel Parvat Teerth is one of the five pilgrimages of Haridwar. It is also known as Siddha Peetha, a place where devotees worship to fulfil their desire. Because of its location, the Chandi Devi temple is also a preferred choice for trekking tourists. You can also reach the temple zenith by the means of a ropeway, the view from which is exhilarating. The historic beauty of Chandi Devi Temple is best experienced as you hike your way up to the top. With the verdant greenery of the surrounding, you will certainly feel the presence of the divine around you. Being one of the oldest and revered temples in Haridwar, this shrine has a tremendous footfall throughout the year. One of the most festive time here is during the festivals of Chandi Chaudas, Navratra and Kumbh Mela when the temple sees amazing celebrations and massive participation. The Chandi temple during the festival time is a must visit. Ganga Aarti is a religious prayer that takes place at the bank of the sacred river Ganga at the Har Ki Pauri ghat in Haridwar. Bringing in tourists and devotees from all over the world, it is a ritual of light and sound where the priests perform prayers with bowls of fire and the ringing of the temple bells. Visitors float "diyas" (small candles) and flowers, surrounded by the chanting of the mantras and the reflection of the lights off the surface of the flowing river, which is said to be blessed by the Goddess Ganga. Haridwar is a sacred town in the state of Uttarakhand, on the banks of the river Ganga. The town is believed to be blessed by the holy trinity of gods: Brahma, Vishnu and Mahesh. Haridwar, literally translating to "Gateway to the Gods", is a passage of pilgrimage for all worshippers who wish to purify and cleanse themselves of sins in the present and previous lives. Those who bathe in the river are said to have achieved "Moksha" (nirvana). The ceremony of bathing in this blessed river is known as Khumb Mela, that takes place in the Har Ki Pauri Ghat every 12 years when million of devotees purge themselves of their ill doings. The Mansa Devi Temple is a famous temple in Haridwar in Uttarakhand that is dedicated to the goddess Mansa Devi, who is considered to be a form of Shakti and is believed to have emerged from Lord Shiva's mind. Thousands of Hindus flock to the temple every year in large numbers to this temple, which is one of the 'Panch Tirths' or the five pilgrimages in Haridwar. The temple is also popularly known as Bilwa Tirth and is perched on the top of the Bilwa Parvat on the Sivalik Hills. The word Mansa means wish, and devotees firmly believe that the goddess Mansa fulfils all the wishes of a dedicated and sincere person who visits the temple. Thus, the magnificent temple is regarded as a 'Siddh Peetha', which is the term that is used to refer to places where desires and wishes get fulfilled. Together with the Maya Devi Temple and Chandi Devi Temple, the three temples constitute the three Peethas that are located in Haridwar. The Mansa Devi Temple holds immense religious importance, not only because of the temple itself but also because it is located in Haridwar, which is believed to be one of the four places where drops of elixir fell accidentally while they were being carried by Garuda, Lord Vishnu's vehicle. This is perhaps why this grand temple has one of the highest footfalls of all temples in north India. The ropeways that lead up to it are yet another feature that adds to the magnificence of the temple and attracts tourists from all across the country. Regarded as one of the most sacred Ghats in Haridwar and India, Har Ki Pauri is a revered landmark and is visited by devotees and visitors in large number seeking the blessings of Holy Ganga by offering their prayers. Har Ki Pauri which literally translates to 'Steps to Lord Shiva' is situated in the holy city of Haridwar which is considered as one of the seven holiest places in the country. A dip in the river Ganges here is believed to wash away one's sins and according to the Indian mythology, it is one of the four places where the drops of elixir ('Amrit') were accidentally spilled by the celestial bird Garuda. The river is filled in a golden hue of countless diyas offered by devotees floating along the river. Har Ki Paudi is the place where River Ganga flowing through the Himalayas touches the plains for the first time. Oozing serenity and calm all the time, it is the evening time at Har Ki Pauri that is most cherished by its visitors. With a plethora of temples at the river bank, offerings are made with lighted candles and diyas floating across the river, an enchanting sight to behold. The chanting of mantras and prayers with sages meditating exudes spiritual vibes and is an experience of a lifetime. The sound of gongs in the background takes one to an entirely different world. Lord Shiva and Lord Vishnu are believed to have visited the place in Vedic times. The large footprints on a stone wall are said to belong to Lord Vishnu. Spread across 249 sq km east of Ganges, the wildlife sanctuary is home to small cats, tigers, elephants and bears apart from various birds. A replica of the Vaishno Devi temple in Kashmir, the temple is marked by tunnels and caves that leads to the inner sanctum containing the shrine of Goddess Vaishno Devi. Local shops in Haridwar sell all the essentials that a pilgrim would need. Looking for a way to worship the subcontinent of India? Bharat Mata Mandir is the place for you. Bharat Mata Mandir is dedicated to India as a country and thereby gets its name from its purpose. Its name translates into "The Temple of Mother India". It is a multi-storey temple that is situated in Sapt Sarovar in the city of Haridwar. This is not a temple that worships gods or has any religious inclination, but one that stands for the many freedom fighters and patriots of the Indian Struggle for Independence. The majestic temple also celebrates the unique trait India and its immense culture. The oneness of the country and its diversity are also a few aspects that the Bharat Mata Mandir brings to our attention. The temple had a grand inauguration in 1983. The late Indian Prime Minister Indira Gandhi was the esteemed person who inaugurated the Bharat Mata Temple. The temple stands at the height of 180 feet and has a total of 8 floors. Each of these levels has a specific theme. Bharat Mata Temple has a massive map of the Mother India on the ground, denoting the statue of the mother of India depicted as a four-armed Hindu goddess wearing saffron-coloured robes, holding a book, sheaves of rice, a mala, and a white cloth. The statue has a design that indicates the Goddess of India for all the religious deities, freedom fighters and leaders. The temple is dedicated to all those who took part in the formation of India as it was built before the partition of India. Elevators are installed in the temple to aid the pilgrims. A famous temple in Kankhal, Haridwar Daksha Mahadev Temple is dedicated to Lord Shiva. This temple becomes a centre of attraction in the month of Sawan when all the devotees flock to the temple to worship. Built in the 11th century, the Maya Devi temple is one of the oldest temples in India. The temple is dedicated to Hindu goddess Maya and is also one of the three Shaktipeeth located in the holy city of Haridwar. Goddess Maya is considered to be a form of Adi Shakti, who is believed to be the Goddess of divine power. Devotees of the Goddess visit in large numbers during Navratra and Kumbh Mela to take her blessings. Maya Devi is considered by many as the chief Goddess of the holy city and no pilgrimage is complete without doing Devi's darshan. It is even considered blasphemous by certain pilgrims to miss out on rendering regards to Maya Devi. Formerly the city of Haridwar was even called Mayapuri in veneration to this deity. The ancient temple is also one of the three oldest temples of Haridwar, which is still intact, the other two being Narayana-shila and Bhairava Temple. Along with goddess Maya, the sacred temple is graced by the idols of goddess Kamakhya and Goddess Kali who are also a form of Adi parashakti. Devotees of the adhisthatri deity Shakti visit in large number during the festival of Navratri and Kumbh Mela to seek her blessing. It is a common belief that the holy temple is a Siddha peeth which means that the presiding goddess has the power to fulfil any desires or wishes of the person seeking Her blessings. In the market at Bara Bazar in Haridwar, you can choose to buy both religious as well as decorative items. Standing on the Railway Road, the market attracts pilgrims and tourists from far and wide. Rudraksha seeds (be ware of the fake ones), churan (digestive powders) and a wide range of sweets made from milk are sold at the shops in Bara Bazar. Ayurvedic medicines make for a popular buy in the market. Sapt Rishi Ashram, located at a distance of approximately 5 km from Har ki Pauri, is one of the most famous ashrams of Haridwar. Hindu Mythology states that the ashram is located, where the seven great sages or Sapt-Rishis, Kashyap, Vashisht, Atri, Vishwamitra, Jamadagni, Bharadwaja and Gautam used to meditate. It is also said that the River Ganges at this place split herself into seven streams, so that the seven sages mediating here would not be disturbed by her flow. Owing to this reason, this place is also known as the Sapt Sarovar or Sapt Rishi Kund. All the seven streams reunite further ahead and flow as Neel Dhara, which forms a beautiful channel while entering Haridwar. Haridwar in Uttarakhand is an important pilgrimage town for the Hindus. The place is a perfect escape from the cacophony of urban life and a beautiful amalgamation of old and new, replete with beauty, culture, history and spirituality. 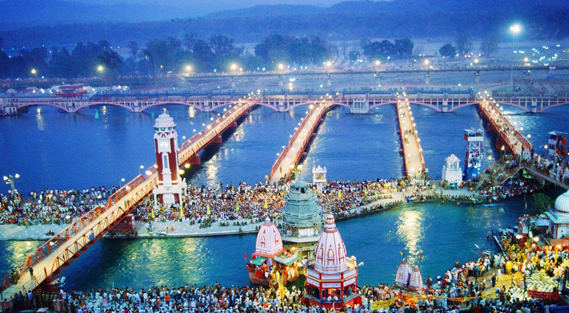 Haridwar is known as the ‘Abode of God’ because of its serenity and scenic beauty by the River Ganga. The most famous fair in the world - Kumbh Mela is celebrated here once in twelve years. It’s a sight that should never be missed. Kumbha Mela has gained International fame as "the world's most massive act of faith". The unflinching trust of millions of devotees is mind-boggling. This spectacle of faith has attracted the curiosity of foreigners as well. The pilgrims come from all walks of life, travelling long distances and tolerating many physical discomforts, just for one dip in the holy river. While some arrive on overcrowded trains, others come by helicopters and planes. But, what remains common is their tremendous faith. Nothing deters the faith of the pilgrims, who celebrate the festival in all pomp and glory. Fathoming the atmosphere of the celebration is difficult. It’s surreal. It’s magical! Shantikunj Ashram lies in the lap (valley) of Ganges (the holiest river of India personified as a female deity). Being situated on the foothills it is under the shadow of the mighty Himalayas (like father protecting his child). The place is strongly charged with spiritual energy generated by penance of the most celebrated seven rishis (seers) of ancient times. The sacredness of Shantikunj has been further enhanced by a high order of ascetic exercises and rituals (including Yagyas, meditation and continuous chanting of Gayatri Mantra) being carried out by millions of devotees round the year. Hence the seeker perceives here a unique celestial protection and ethereal environment surcharged with spiritual energy. These are a few reasons amongst many other because of which the divinity may well have understandably considered this locality suitable for taking up the Herculean crusadem for establishing a new world order in the third millennium. A believer can without much effort perceive the charge of spirituality within a short period of stay at this place. Shantikunj Haridwar was founded by the Saint-Scholar-Philosopher par excellence, Pandit Shriram Sharma Acharya, who in his youth was also a freedom fighter. Shantikunj has emerged over the years as a unique center and fountain-head of a global movement of Yug Nirman Yojana (Movement for the Reconstruction of the Era) for moral as well as spiritual regeneration in the light of very old Indian heritage. It is the head-quarter of Yug Nirman Yojna of the All World Gayatri Pariwar (or Akhil Bhartiya Gayatri Pariwar), which has a following of more than twenty million devoted disciples and seventy million persons all over the world. Located in Kankhal in Haridwar, Ma Anandamayi Ashram is a spiritual centre and ashram dedicated to Sri Ma Anandamayi who was a prominent Bengali mystic and a spiritual personality. The ashram has a mausoleum or a Samadhi which houses the grave of Ma Anandamayi. The complex houses several buildings meant for meditation, yoga and similar activities. Pawan Dham Temple is one among the most visited pilgrimage shrines in Haridwar. Devotees who come to Haridwar can never afford to miss a visit to Pawan Dham Temple. The temple is one of the oldest doms in the state of Uttarakhand. The ornamental Idols are the biggest attraction within the shrine. Swami Vedantanand ji Maharaj is the founder of the temple. The fascinating beauty of the temple itself defines the great work of art. The wonderful work of glasses and artistically designed walls are the main reasons of its popularity. Ultimately, the aesthetical work describes the rich culture and heritage of the ancient India. A holy visit of to the ancient temple is believed to make oneself free from one's sin. Located on the Delhi - Haridwar Highway at Kankhal, Patanjali Yog Peeth is possibly the largest yoga ashrams in all of the world. The institute is the flagship project of Rishi Ramdev and is the centre is used to research yoga and ayurveda. The centre is spread over vast acres of land and is divided into two campuses. Birla Ghat is situated adjacent to Vishnu Ghat and is equally pristine and tranquil. Known to be the most ancient ghat of the city, the site has umpteen eateries, food stall and eating joints. The river bank has a flight of stairs which are used to descend in the river for a holy dip. Gau Ghat, located across Subhash Ghat, is among the sacred sites of Haridwar. This ghat got its name from those who come here to pardon the sin of slaughtering cows. In addition, the ghat is also visited by those who want to offer solace to their near and dear ones. Gau Ghat is the same ghat where the ashes of Mahatma Gandhi, Jawaharlal Nehru and Indira Gandhi were immersed. Swami Vivekanand Park is one of the few amusement parks in Haridwar located near Har ki Pauri. The park is triangular in shape and boasts of lush green lawns and flowering beds. It also houses a massive statue of Swami Vivekananda which is the highlight of the park. It is ideal for day picnics and jogging activities. Situated on the Saptasarovar Marg, Bhuma Niketan Temple is a popular pilgrim spot in Haridwar. The shrine houses magnificent idols of several gods and goddesses; however, the highlight of the temple are the sculptures of Shiva and Parvati adorning the entrance gates of the shrine. The temple is surrounded by water fountains and green lawns. Neel Dhara Pakshi Vihar is situated at Bhimgoda Barrage in Haridwar and has a rich flora and fauna. A popular tourist spot, the site offers rare bird watching opportunities and a panoramic view of the Shivaliks in the backdrop. The place is famous for its unrealistically beautiful locales and is a must visit if you are in the area. Parad Shivling, located at a distance of 2 km from Haridwar, is dedicated to Lord Shiva. The shivling is enshrined inside the Harihar Ashram, which is based in Kankhal. Weighing around 150 kg, the shivling is visited by large number of devotees every year. Apart from this, the Rudraksha tree is the main attraction of this ashram. Situated in Bhimgoda in Haridwar, Jai Ram Ashram was established in 1891. Later, a lot of modifications were made in the temple and a satsang bhavan, dispensary and Sanskrit college were added. Currently, the ashram hosts regular kirtans and satsangs and is facilitated with several rooms for the accomodation of the pilgrims. Bilkeshwar Mahadev Temple is situated on a hillock near Har ki Pauri near the woods and is dedicated to Lord Shiva and his consort Parvathy. The complex also houses smaller shrines for Lord Hanuman, Lord Ganesha, Mata Rani and Mahadev. The spot is also used as a weekend getaway owing to its beautiful locales. Doodabhari Barfani Temple is a cluster of several small shrine dedicated to various Hindu gods and goddesses. The temple is built completely out of white marbles and is a popular tourist attraction in the city. Besides it has attractive interiors and elaborately carved exteriors. The highlight of the temple is the Ram-Sita and Hanuman Mandir. Bhimgoda Tank is a sacred water tank situated near Birla Ghat in Haridwar. The tank is named after Bhima - one of the five Pandava brothers. The tank is refurbished with the water of the Ganges and is surrounded by well-groomed lush gardens. The locale is also beautified with water fountains and flower beds and hence is a popular tourist spot. Situated a little on the outskirts of the city in Ranipur near Haridwar, Sureshwari Devi Temple is dedicated to Goddess Durga. The temple is located amidst dense green forests and beautiful natural locales and hence it also makes up for a popular tourist spot near the city besides being an important pilgrimage centre. Kushavarta Ghat, located at a distance of 0.5 km from Har Ki Pauri, was constructed by a Maratha queen Ahilyabai Holkar. It is one of the ideal religious destinations for devotees who wish to perform Shraddha rites for the departed souls. According to a popular belief, it is said that this ghat is related to Dattatreya, who was a great saint of the ancient period. It is believed that he had made a visit to this ghat several times and also mediated on this ghat. According to the chronicles of history, it is stated that it is this ghat where Dattatreya offered his penance by standing on one foot for thousand years.